NAP, Inc.'s popular Sleepy Wrap wearable baby carrier is now available online and in stores nationwide at A Pea in the Pod® and Destination Maternity®. NAP, Inc. is dedicated to providing parents with the highest quality, best fitting and safest wearable baby wrap. Sleepy Wrap makes babywearing easy. NAP, Inc. announced today that their popular Sleepy Wrap baby carrier is now available at Destination Maternity®, the world's largest maternity retailer. 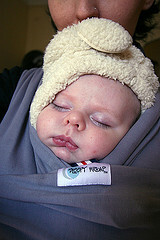 The Sleepy Wrap is also available at A Pea in the Pod®, and online at destinationmaternity.com and apeainthepod.com. NAP, Inc. is one of the most established and reputable baby wrap companies in North America and is dedicated to providing babies and parents with the highest quality, best fitting and safest wearable infant carrier. "Our steadfast mission in creating the Sleepy Wrap has always been to provide the highest quality, most comfortable, durable and wearable baby wraps for all parents - and give them a helping hand in raising confident, joyful and compassionate children," said Robert Antunovic, CEO of NAP, Inc., co-creator of the Sleepy Wrap. The affordable, wearable Sleepy Wrap is the most natural way to put a baby to sleep - close to the parent's warmth, voice, scent, movement and heartbeat. It provides excellent support for a baby's head, neck, hips and legs and offers a perfect custom fit every time without being too tight or too loose. Sleepy Wrap is made with a high quality, yet soft heavy cotton knit with just a touch of spandex and there are no digging straps, poking buckles or buttons. The baby wrap holds the child high against an adult's chest and allows for discreet nursing. It places no pressure points on an infant's developing hips, spine or pelvis and is optimal for babies yet can be used for toddlers as well. 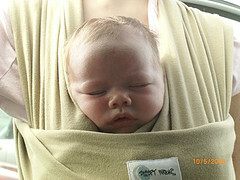 Sleepy Wrap is also excellent for kangaroo care, as premature infants thrive in this comforting baby wrap. One size fits all adults and cleaning is a breeze - just machine wash, tumble dry and go. Sleepy Wrap is $39.95 and is available at A Pea in The Pod® and Destination Maternity® stores in the color black. Destination Maternity® is the home of the world's leading maternity brands Motherhood Maternity®, A Pea in the Pod®, and A Pea in the Pod Collection™. It is a one-stop shop for the most extraordinary selection of maternity fashion, accessories and everything imaginable for the pregnant woman. Visit http://www.destinationmaternity.com for a $1,000 wardrobe sweepstakes, a baby namer, pregnancy information, and expert advice. Babywearing is comfortable for both parent and baby - get the perfect fit everytime. Sleepy Wrap Baby Wrap can be used with newborns through toddlers. The standard Sleepy Wrap Baby Wrap comes in several colors.The standard Sleepy Wrap Baby Wrap comes in several attractive colors! Sleepy Wrap - Dad's love it.The Sleepy Wrap is an amazing way for Dad and Baby to bond. Sleepy Wrap BoxThe Sleepy Wrap baby carrier comes in a hip, modern package - makes a great gift. Organic Sleepy Wrap - NaturalThe New Organic Sleepy Wrap in color "natural" Sleepy Wrap Baby CarrierSleepy Wrap Baby Carrier has 27 advantages over other infant carriers.